Anglesey, the island off the north-west coast of Wales, was once the centre of the Druid religion, which the Romans were at pains to exterminate. In the 13th century it was strategically important in Edward I’s conquest of Wales: not only did it control access by sea to the whole Snowdon massif, but as a comparatively flat area it provided the best farmland in north Wales. Edward seized the island in 1267, in his war against the Welsh prince Llywelyn ap Gruffudd, only to return it to Llywelyn in a peace treaty a few months later. In 1272 Llywelyn was killed in battle and his brother Dafydd was captured and executed the next year. After more revolts in 1294-5 Edward was determined on a permanent subjugation of Wales. 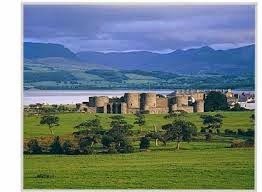 Anglesey was taken by amphibious assault in spring 1295. A town called Llanfaes in the most easterly part of the island, commanding the entrance to the Menai straits between Anglesey and the mainland, was destroyed and its inhabitants resettled in Newborough. In the hope of attracting new settlers, the place, which was low-lying, was renamed “the beautiful marsh” – “Beaumaris” in Norman French, which was still the language of the court. (Compare the Marais district of Paris). Here Edward’s master-builder, James of St. George, was instructed to build a castle. Since the site was completely flat, with no natural defensive features, Master James designed a classic concentric castle, square in shape, with a moat supplied from the sea, a gatehouse and inner and outer baileys separated by a massive inner wall. The castle looks as if it was intended for comfortable living as much as for defence. Certainly it was never finished, and was never attacked. The town of Beaumaris lies outside the gatehouse: a peaceful little coastal resort, with fine views across the narrow straits to the looming mass of Snowdon.